This is some of his magazine work that I know of, which gives a general picture of how he made a living as an illustrator and writer in his early career. I am always looking for more examples of his work, and often discover things for the first time on eBay, especially when a seller is good enough to list all the stories and illustrators in a piece of ephemera. I don't necessarily own everything listed below -- eBay is a fickle mistress! Want to help identify more of his work? Check this list that I extracted from his account books from 1933-1950. New York Herald Tribune, Sunday, March 28, 1926, p. 8: story entitled "What Volstead Did for a South Sea Isle"
The Literary Digest, May 1, 1926, pp. 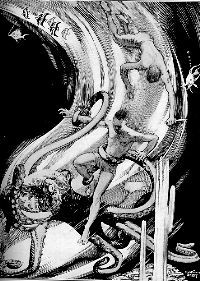 60-61: story entitled "In the Toils of an Octopus"
The Literary Digest, May 8, 1926, pp. 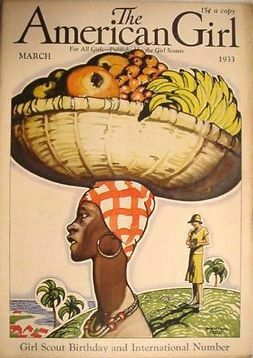 58-62: story entitled "Ruining a South Sea Paradise to Flavor Soft Drinks"
New York Herald Tribune Magazine, Sunday, July 25, 1926, Section VIII, pp. 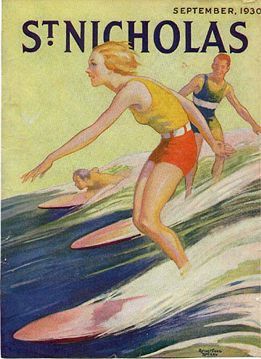 1-2: story entitled "American Films in Tropic Tahiti"
The Danger Trail, November 1926: story entitled "Kai-Make -- The Sea of Death"
Good Housekeeping, June 1933: 2 illustrations for the story "Marriage as it ought to be" by Margaret Weymouth Jackson. The American Girl, July, August, and September 1933: several illustrations for the serial "Log of the Altair" by Edith Ballinger Price. St. Nicholas Magazine, September 1933: illustrations to accompany the article "The Greatest Show on Earth"
All-Story Love Stories, December 2, 1933: illustrations to accompany the story "Decoy Girl," by Evan Law. All-Story Love Stories, February 15, 1936: illustrations to accompany the story "Shotgun Wedding," by Lynn Ellsworth. All-Story Love Stories, August 28, 1937: illustrations to accompany the serial "Don't call me Darling"
The American Girl, December 1941: illustration to accompany the story "Katie's Galapagos Xmas"
Child Life, February 1942: illustrations to accompany the story "The Mystery of Skull Island" by Undine Dunn. 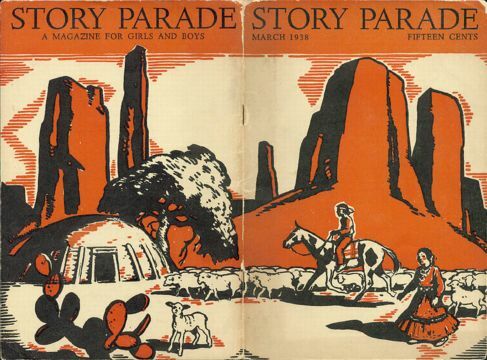 The Horn Book Magazine, May-June 1943: "A Part of Victory"
Story Parade -- A Magazine for Boys and Girls, July 1943: black-and-white illustration for the poem "Ships of Free America" by James S. Tippett.